If you like the Bourne movies and writers like Lee Child, Robert Crais & James Patterson you’ve come to the right place. With a well-researched, fast-paced style, Angels’ Cut is a topical conspiracy thriller and first in the Angels’ Share series. Investigative Journalist Eilidh Duncan is on the treacherous, twisting trail of organised fraud and deception. At the dark heart of The UK Establishment, she documents a business-like operation built on greed, police corruption, abuse of power and ‘closed-ranks’ disinterest. Such people hate being exposed. If they don’t want the light of publicity, they can fix it. Push them hard enough and they harm people. They take Eilidh and her nightmare begins. How long before frighten-her-off becomes kill her? Relaxed and unsuspecting, big brother Sam heads to London. Danger closes as fast as his express train. He investigates using skills he learned as a tier-one operator. All hell breaks loose as he plummets into a malicious criminal web of confusion, betrayal and stunning violence. As if that isn’t enough, they attack his family. 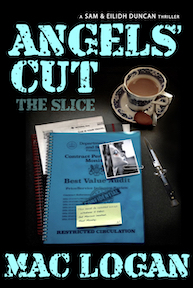 Angels’ Cut is Scottish crime and mystery writing with an international dimension. If you enjoy a thoughtful plot, ferocious action and characters you’ll come to care about … or dislike, you’re at the right place. Angels’ Cut starts like a British detective thriller and bursts into breathtaking conflict. Mega-crime, political conspiracy and the cruel realities of high-level corruption and cover-up means danger. WITH THE BACKING of his wily special-forces minder, Tonka, mayhem ensues in this vibrant and intelligent thriller. A desperate race across the remote Scottish Border country sets up a savage ending. When it gets to the wire, their lives depend on the answer to a simple question … has Sam still got what it takes? Read Dark Art (the DICE), second in the series.